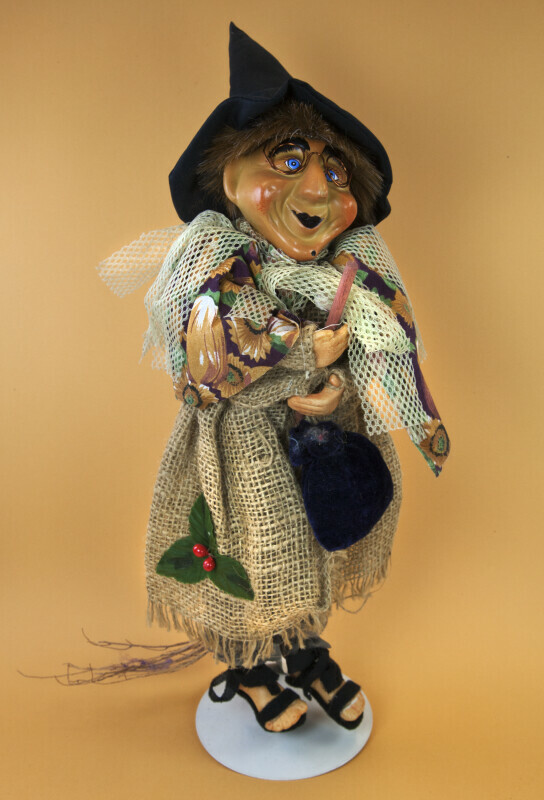 Handcrafted Italian witch doll. Her face, hands and feet are ceramic, and are very detailed. She is wearing large glasses, made from wire, and she has a wart on her face. Riding her broom made from wood, she is wearing a bright, print shirt, a coat made of burlap, and sandals. She has a white scarf made from netting around her shoulders. She is carrying a black bag, and there is a piece of holly on her skirt. In Italy, she is known as La Befana, the Christmas witch, who leaves presents for Italian children on January 6, Epiphany. The figure stands 16 inches (41 cm) tall. WARNING: You are about to download a 31.6 MB TIFF!